Sister Mariana Koonce, RSM, MD, accepts a check for $2,749 from members of the Knoxville Academy of Medicine Alliance. The check was presented to Sister Mariana and the St. Mary’s Legacy Clinic for the clinic’s share of proceeds from the 14th annual Doc Rock fundraiser, which was held Jan. 26 at the Concourse at the International near downtown Knoxville. Presenting Sister Mariana with the check are, from left, Kirstin Kropilak, Cynthia Gash, Nancy Sewell, and Robin Hutchins. The KAMA members with Sister Mariana attend the Cathedral of the Most Sacred Heart of Jesus. Doc Rock is a battle of the bands that features music groups with at least two members who are doctors. Each band represents a non-profit health care provider in the community. Those attending Doc Rock vote on their favorite band and non-profit organization. The St. Mary’s Legacy Clinic staff and volunteers wish to thank Fr. David Mary Engo and the Christ, Prince of Peace Retreat Center staff, for hosting a Lenten Day of Reflection on Friday, March 22nd. It was a beautiful day to be at the newly renovated Diocesan Retreat Center and to be spiritually refreshed in the Lenten Season. Fr. David Mary offered 2 spiritual conferences, Mass, a Holy Hour of Adoration with Benediction, and confessions. Many thanks to the Knights of Columbus of St. Mary’s Catholic Church in Athens for providing lunch. Pictured are Sister Mariana, Patti Pemberton and Carolyn Hall (kneeling); Dana Myers, Vivian Brocato, Carla Neale, Diane Schwartz, Fr. David Mary, Kat Dull, Karen Humphries (hiding) and Gloria Risko (2nd row). New Volunteer Orientation in May! St. Mary’s Legacy Clinic will be holding the next New Volunteer Orientation on Thursday, May 30th from 9:00am – 3:00pm at the Church of Divine Mercy. If you are interested in attending, please visit the “Become a Volunteer Tab” and print out an application to submit. If you need additional information or have questions, please call the clinic office at 865-212-5570. On Thursday, February 21st we celebrated FIVE years in Athens! Please join the St. Mary’s Legacy Clinic staff and volunteers in giving thanks to God for all His many blessings on the mobile clinic. We celebrated the day with one of our scheduled visits to our site in Athens. Thank you for all your many prayers on behalf of this beautiful mission to the poor and marginalized in East Tennessee. Our Fall Nursing In-service will be held on February 22, 2019 at 10919 Carmichael Road, Knoxville, TN 37932. 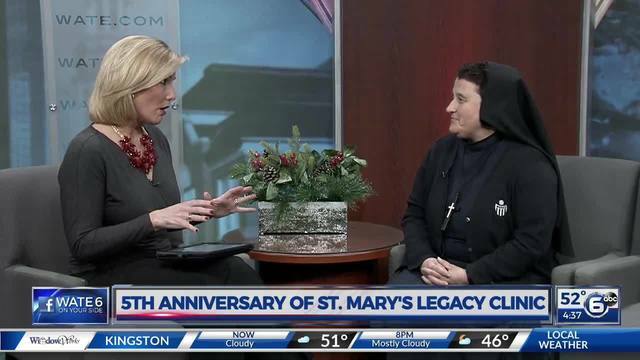 St. Mary’s Legacy Clinic was featured on Grainger Today. Click on the link below to read the article. St. Mary’s Legacy Clinic was featured on WATE 6 On Your Side. Click on link below to see the interview. 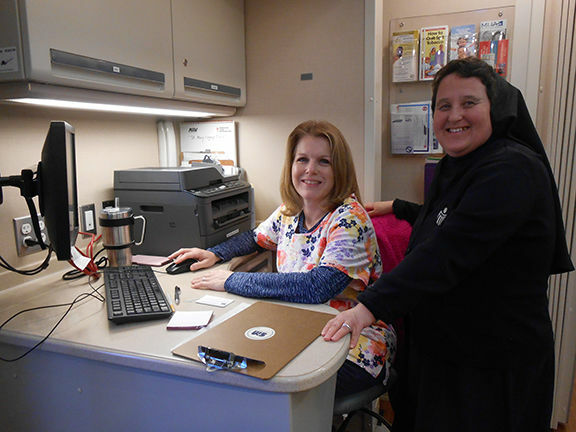 St. Mary’s Legacy Clinic was featured in the Crossville Chronicle on February 11th to celebrate our 5th year anniversary. Click the link below the picture to view the full article. On Wednesday (February 6th) we celebrated FIVE years in Washburn! God has blessed this mission tremendously. When we started we sometimes would have no patients or just one or two. On Wednesday we had a full schedule plus handled a couple of walk-ins. Thank you Washburn and Grainger County community for allowing us to serve you the past 5 years.